The patient’s car pulls into the parking lot of the ASC. He is here for his pre-anesthesia/surgery assessment and education visit. He can’t help but notice that there is trash here and there around the lot. A nagging little thought enters his mind about the apparent disregard for tidiness. He approaches the front door of the Center and, again, notices some pieces of napkins and a styrofoam coffee cup lodge in the corner by the entrance. There is a sand-filled ashtray near a bench, but the ashtray is overflowing. That nagging little thought is getting bigger. When he enters the reception area he notices the wilting—almost dead—plant on the corner of the reception desk. The carpet shows a clearly defined dark/dirty traffic path. The upholstery on one of the chairs is badly stained while another is clearly frayed along the front seam. Does the above scenario sound implausible? It shouldn’t, for it is a scene CMS surveyors are reporting across the country. That patient’s nagging thought becomes a roaring symphony to CMS surveyors entering a Center. In assessing the housekeeping practices in some 36 surgery Centers across the US what was discovered was that the ASC leaders largely hired housekeeping contractors who had “experience” cleaning healthcare facilities. However, some of this experience was in cleaning doctor’s offices. Some did list other ASCs. On occasion, some owners of the housekeeping service had worked, themselves, in the housekeeping department of the hospital. Several Centers interviewed performed all the housekeeping inservices internally using their RN staff. In none of the Centers did the organization meet with the housekeeping staff themselves to perform training or to observe their cleaning practices. And yet, virtually all of the Centers had quite a litany of complaints regarding the services that were being delivered. Water stained ceiling tiles throughout many Centers. These stains harbor bacteria. Rust on stretchers, or tables, IV poles, the legs of instrument tables, anesthesia and emergency carts, endoscopic cleaners, in and on sterilizers, medical gas connectors, oxygen tanks and connectors…the list becomes extensive. Rust harbors bacteria. Dust—everywhere! Windowsills, blinds, tops of suction canisters, the top of emergency and anesthesia carts, microscope arms, behind equipment on counters, inside drawers in medication rooms and in the OR and sterile processing. Dust is a large contributor to post-op infections! Chipped and peeling formica throughout the Center on doors, counters, cupboards. This leaves a surface that is far from ‘seam-free’ and harbors bacteria. Peeling and torn wallpaper—again, not smooth and seam free for washing w/o harboring bacteria. Chipped paint on walls and door frames—same story as above as far as preventing adequate cleaning. Nasty, dirty areas behind sterilizers and open drains that are full of what looks like mold. Mold in air vents—dirty and dusty air vents. Separated back splashes leaving gaping spaces between the back splash and the wall in sterilization and soiled cleaning rooms. Housekeeping closets that either have no or too long black hoses that are touching the bottom of the sink pan. Housekeeping closets that are dirty, cluttered and un-kept. Corners of floors, especially behind doors, that are dirty and appear to have been ‘waxed over’. In one Center, CMS instructed the ORs/Administrator to demand the housekeepers come in during the day shift in order for CMS to observe their cleaning the ORs. It was disastrous! The cleaning crew mopped the OR walls with dripping mops starting at the bottom and working their way up. In addition, the same mop head was taken into the second OR to use, but, then, so was the same bucket of water! While observing housekeepers in another Center, the observation was made that the housekeeper pushed the bucket full of solution out of the one OR, mopped the OR corridor and proceeded into the Pre-op/Recovery area. When the observer questioned the housekeeper as to when she would change the water/solution in the bucket, the housekeeper replied that she changed it when it got dirty! In another Center where the RN staff performed all housekeeping duties, it was discovered that counters were never being cleaned, nor was deep cleaning behind equipment, or corners being done. It appeared that the old ‘a lick and a promise’ was the rule of thumb, as this service was being done at the end of the day’s schedule, and staff were eager to ‘get out of here’. We have to carve out the time to address this very serious issue. Comprehensive Housekeeping Policies. Surgery Centers should have comprehensive housekeeping policies. Housekeeping guidelines for hospitals and healthcare facilities can provide the stepping stone for your policies and protocols. Look at every area beginning with the entry into your Center. What does it tell the patient about what he can expect from a safety/infection-free environment for him? What does it tell him about your commitment to cleanliness? Patients know about sterility. They strongly suspect that the place where they are having their surgery should be above and beyond clean, if their outcome is to be good. They all have friends or family, or they know someone who got a post-operative infection. The condition of your Center also has a huge impact on your marketing. What does it say to your patient community if you have not maintained your Center either physically or through housekeeping? Orientation. Develop a housekeeping orientation program and tools. Include all areas and essential tasks. Look at your own expectations in each area. Meet with your key staff members to discuss and explore their expectations, issues and complaints. Incorporate clear instructions based upon this analysis as part of the housekeeping orientation. Tools and Recommended Practices. Develop housekeeping checklists for each area. Look at recommended practices from the AORN. These checklists should include terminal cleaning of the ORs, the expected schedules for the cleaning of all areas and the contents of all the different rooms. What pieces of equipment are they to clean, if any. Also, develop checklists to document what the nurses are expected to clean and how often. In developing checklists identify those things that are outside of the daily or weekly routine; e.g., carpets, tile, windows, upholstered furniture, stripping and waxing floors, woodwork, doors, inside cupboards, etc. Housekeeper’s checklists should hang in their closet. Get in the habit of checking these several times a month. Put together a housekeeping training packet and meet, not only with the supervisor, but with the housekeepers who are going to be cleaning your Center. Determine whether or not the housekeepers have had training in both blood-borne pathogens and toxic/hazardous substances, but also HIPAA. If not, provide them with those policies and demand that the contractor provide further, documented training. Provide the housekeepers copies of your housekeeping policies and complete the orientation tool. Observe their cleaning practices. During the orientation and training period there should be a conversation regarding the ability of the housekeeping staff to read and speak English. If the staff is unable to do so, you are expected to provide instructions, checksheets, MSDS in their language! There are sources for this available on the internet, or contract with an interpreter to make these changes. You can also have the interpreter provide all the instructions verbally. Document this in the contract workbook with their contract. Orient the ASC staff to housekeeping practices. This should include not only what can be expected from the housekeepers, but what is expected of them. It is unfortunate that we still see RNs who drop some piece of paper on the floor and leave it stating that it is not in their job description to clean, or they call the MA to pick it up. The RN’s job is to provide a safe environment for their patient. This includes a clean environment. During a recent survey, the surveyor did the white glove test on the bottom of a drawer in the medication room. She held up a finger laden with dust and showed the RN who was the medication management nurse. The RN said, ‘housekeeping doesn’t clean inside drawers.’ The surveyor remarked, ‘and clearly, neither do you, nurse!”…..not a good impression…and this is a room where medications are prepared! CMS expects that the leaders are periodically observing the housekeeping staff at work. Schedule a midnight visit at least several times a year to ensure that best practices are being followed. Lastly, CMS also expects that the leaders of the organization are conducting housekeeping inspection tours. It makes sense that the infection control coordinator be responsible for monitoring the housekeeping practices in the Center. However, the leaders should hold this person accountable by reviewing the logs on a regular basis and demanding that the housekeeping practices and results of the weekly housekeeping inspection tours be included in her quarterly infection control report to the QA/PI meeting. 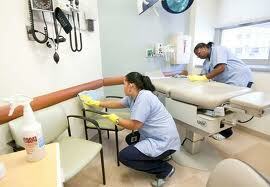 In closing, housekeeping practices are the backbone of the Surgery Center. Without good, sound and solid housekeeping services, low infection rates are in jeopardy, and, eventually, word is going to get out that your Center is less than an ideal place for patients to have their surgery. Remember, they do have a choice.